The Goldstein garden features a French country home in Starweather for the 16th annual Sawtooth Botanical Garden Tour on July 16. To walk in the many gardens of the Wood River Valley is a treat and educational experience. For 16 years, the Sawtooth Botanical Garden has made this experience an integral part of its programming and community bonding. On Saturday, July 16, the 16th annual Garden Tour will take place from 10 a.m. to 2 p.m. and will feature seven mid-valley homes. Tickets are $20 for garden members, $35 for nonmembers or $45 for a ticket and a new garden membership. 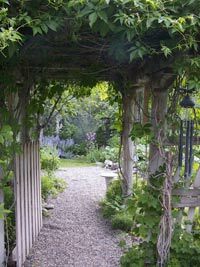 Garden Tour tickets are available at the Sawtooth Botanical Garden, Chapter One Bookstore, Sun Valley Garden Center and Webb in Ketchum and Hailey. Tickets and Garden Tour booklets are also available at the gardens during the Garden Tour. The tour will include lemonade refreshment stands operated by the Girl Scouts. "It's a fabulous tour," said Sawtooth Botanical Garden Executive Director Carter Hedberg. "All the homes are along the Big Wood River featuring a variety of topographies." Hedberg said there are challenges to creating gardens in the valley, including wildlife, weather and soil. "We want to make the tour and the Sawtooth Botanical Garden accessible to the public and will offer a reduced membership and tour price for the public," he said. "It's the one day a year we do this." On the same day after the tour, the Sawtooth Botanical Garden will hold its fundraising party Gimlets in the Garden at the Sawtooth Botanical Garden in Gimlet from 6-9 p.m. The evening will feature music by the Joe Fos Trio, hors d'oeuvres, cocktails and a silent auction. R.L. Rowsey will serve as master of ceremonies. Tickets to the Gimlets in the Garden party are $100 per person. In addition, raffle tickets are also available for a $5,000 Visa card to be drawn at the party. Raffle tickets are $10 each or six for $50. "The event will also have a fortune teller, food by David Fox and an open bar," Hedberg said. "The assortment of silent auction items is amazing with trips, an antique tractor and lots more." Hedberg said the garden has never looked better. "The Alpine Garden is complete and blooming," he said. "We are showcasing what we have accomplished from the last year. It's a mature garden." The Sawtooth Botanical Garden is a community resource showcasing native and cultivated plants that flourish at high altitude. It fosters environmental stewardship through education, events, displays and plant collections.